Many children (and adults) suffer from seasonal allergies. As pollen counts rise and allergens flood the environment, sniffles, sneezes, and itchy, watery eyes become the norm. It may sometimes be hard to tell if a child has a cold or allergies, but there are ways to tell the difference! If a child does indeed have allergies, there are ways to combat them so that he or she doesn’t have to suffer all season long. Runny noses, sneezing, fatigue, and headaches can all be symptoms of both colds and allergies. However, symptoms can be told apart by a discerning eye. While children with allergies will often complain of an itching nose, this is not generally a symptom of a cold. In addition, allergies cause itchy, watery eyes, but colds generally do not. If your child continuously rubs their nose and has itchy eyes, chances are they are being affected by allergies rather than a cold. There are a number of preventative measures parents can take in order to lessen the suffering of their children. In allergy seasons, it’s a good idea to close all doors and windows, especially during high pollen counts, to prevent allergens from invading the house; air conditioner filters should also be changed every month. Plus, after coming inside after being outdoors, children should change their clothes and wash their face and hands in order to rid themselves of any lingering allergens from outside. These measures can help keep allergy symptoms down. 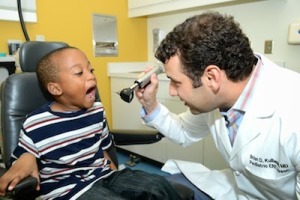 If allergies are severe, it’s a good idea to see a pediatric ENT specialist such as those at PENTA. There are stronger measures that can be taken in order to relieve allergy suffering in children, as well as tests that can be done in order to identify the exact allergens that your child is sensitive to. It seems like a catch-22: children suffering from allergies tend to be miserable, but keeping kids cooped up inside to stay away from allergens is equally bad. However, if parents follow the guidelines outlined above, their children should be able to play outside a moderate amount while still keeping allergy symptoms low. There are over-the-counter medications that can help with symptoms as well, and your pediatric ENT specialist should be able to help further if over-the-counter medications combined with the above guidelines do not help sufficiently. If your child is suffering from allergies and it seems like nothing helps the symptoms, don’t hesitate to contact the experts at Pediatric ENT Associates Birmingham. Call (205) 831-0101 to make your appointment today!